AUSTIN - The Austin Spurs, presented by SWBC, today announced an expansion in their partnership with Central Texas Pain Center that includes moving the pain relief specialist's logo from the back of the team's jerseys to a more prominent location on the front. The Central Texas Pain Center logo will be visible on the front of both the home and road Austin Spurs jerseys, just below the numbers. The jerseys will be unveiled today during the team's annual media day at the Cedar Park Center. 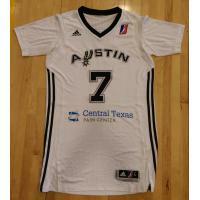 Fans will have the first opportunity to see the updated jerseys in person when the Austin Spurs tip off the 2015-16 season at home against the Texas Legends on Friday, Nov. 13. With offices located in Austin, San Antonio, San Marcos, New Braunfels, Waco, Seguin and Killeen, Central Texas Pain Center is committed to treating patients suffering from any type of acute or chronic pain and restoring them to their previous level of functionality. "The Austin Spurs and Central Texas Pain Center are both built on teamwork and communication," said Dr. Eric Miller, President of Central Texas Pain Center. "We are proud to be a part of the success of the Austin Spurs and we are excited to expand our partnership this year, visibly placing the Central Texas Pain Center logo next to the Austin Spurs name." "Central Texas Pain Center has been a great partner to the Austin Spurs over the past year," said Tim Salier, Spurs Sports & Entertainment Vice President of Franchise Business Operations. "We are pleased to both extend and expand the partnership for the 2015-16 season." The Austin Spurs open the 2015-16 season at home at the Cedar Park Center on Friday, Nov. 13. Season tickets are available now. For ticket information call the Austin Spurs office at (512) 236-8333 or visit austinspurs.com.